New Year’s Challenge – What’s the Main Course? Happy New Year! In this month’s column, I offer two recipes – one for an appetizer course and one for a salad course – for a winter dinner party. I also pose a challenge to you, rather than ask you to commit to a New Year’s resolution, namely, to propose an idea for the main course. The person who e-mails me by January 31st with the most fitting dish will receive a package of D’Artagnan duck bacon. No recipe is required, just the idea…although, if you have a recipe, please do not hesitate to share that as well. These recipes are intended for 6. The first course is fried duck egg and duck bacon over roasted fingerling potatoes. This dish offers a unique way to feature duck, not the typical duck confit or grilled duck breast. Duck eggs are richer than chicken eggs and have a firmer texture. Duck bacon is thicker than regular bacon and has a pleasant smoky flavor. D’Artagnan, out of Newark, New Jersey, sells duck bacon that has been rubbed with salt and sugar and smoked over wood chips. The salad course of Nantucket Bay Scallops over arugula and endive features the highly prized Nantucket Bay Scallops, which are in season from November through March. These little treasures are sure to wow your guests with their delicate and naturally sweet flavor. Nantucket Bay Scallops are just a fraction of the size of sea scallops, but they will beat their larger counterpart in any taste test. Wash and cut the fingerling potatoes. Use the tricolored (red, white and purple) fingerlings if available as they will add a vibrant color to the dish; otherwise, any fingerlings will work well. Place the potatoes in a baking dish and season with sea salt and fresh ground pepper to taste. Squeeze the juice of one lemon and drizzle olive oil over the potatoes. Place the baking dish in an oven preheated to 400 degrees, and bake for about 40 minutes or until the potatoes are soft when you poke with a fork. When the potatoes are almost finished, prepare the bacon and then the eggs. Place the strips of duck bacon in one layer in a nonstick frying pan. You will probably have to use two frying pans so that the bacon is not layered. Place the pans over medium heat and cook the bacon until browned and slightly crisp. Set aside the bacon on a paper towel. Fry the eggs in the same two pans that you used to cook the bacon. Place 2 tablespoons of butter and 2 tablespoons of olive oil in each pan over medium heat. When the butter is foaming, break and place the eggs in the pans. Turn the heat down to medium-low and cook the eggs for about 3 minutes so that the whites are set but the yolks are runny. While cooking the eggs, place a serving of potatoes on each plate. When the eggs are ready, remove them from the pan using a spatula, and place one egg on top of each serving of potatoes. Place two slices of bacon on top of each egg. Place a small bed of arugula and several leaves of endive on each small plate. The peppery taste of the arugula will complement the sweetness of the scallops. Heat a nonstick pan over medium heat and add a few tablespoons of butter. Allow the pan to heat up and the butter to foam. Tilt the pan around so that the olive oil and butter coat the bottom of the pan. You may test whether the pan is hot enough by running your fingers under water and then “spritzing” water into the pan. If the water “skeetches”, then the pan is hot enough. Once the pan is hot enough, place the scallops in the pan with space in between them so that they may sizzle. These tiny scallops cook quickly – only one or two minutes at most. They will become opaque when cooked. Place the scallops over each bed of greens. Squeeze lemon juice and drizzle olive oil over the scallops. Add finishing salt and fresh ground pepper to taste. I look forward to receiving your main course submissions – meat, fish, pasta, vegetarian – all are welcome! © 2013, La Cucina di Poppiti, LLC. All rights reserved. This article originally appeared in the January 2014 issue of The Journal of the Delaware State Bar Association, a publication of the Delaware State Bar Association. Copyright © Delaware State Bar Association 2014. All rights reserved. Reprinted with permission. Chef Kevin Sbraga’s new restaurant, The Fat Ham, is slated to open this Friday, December 6th in University City. Last night, my husband Vincent and I were fortunate enough to attend Friends and Family Night where we experienced the real deal in contemporary Southern food at an unlikely location on Philadelphia’s Left Bank. Located at 3131 Walnut Street, The Fat Ham is Kevin Sbraga’s second restaurant; his top rated, flagship restaurant, Sbraga, located on Broad Street opened in 2011. Ben Fileccia, the general manager of Sbraga, has brought his leadership talents to the other side of the Schuylkill. The Fat Ham is a relaxed and cozy, 44 – seat space that boasts wood topped tables, eclectic seating and subway tiles that form unique wall art – the fat ham. Other distinctive touches are the whiskey barrels for aging cocktails in the bar area and the servers’ plaid shirts, which add to the homey feel. 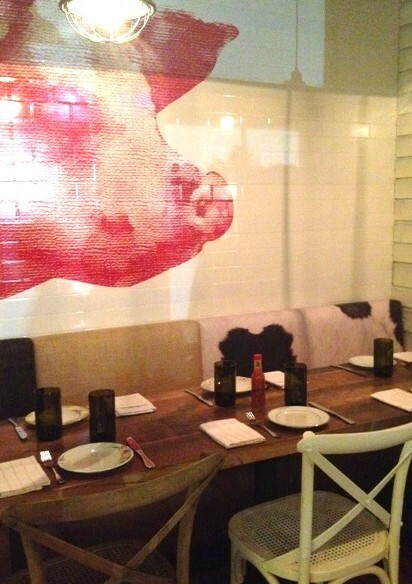 The bottle of The Fat Ham hot sauce on each table – made in house, of course – is a sign of the pleasant spiciness to the fare. The bread, a corn biscuit in true Southern style, had just the right touch of sugar, allowing the natural sweetness of the corn to take center stage. As there are no main courses, the more than helpful (and able to navigate a small space with agility) waitstaff recommends that each guest order three dishes, which are served family style and intended for sharing. We started with a salad of mustard greens with benne (sesame) seeds, peanuts and hot vinegar dressing. This refreshing, light salad packed a subtle heat in its vinegar dressing. We then enjoyed the “Fat Ham Board” of bacon, ham, chicken liver and terrine paired with pickled vegetables and toasted bread points. The chicken liver was among the best I have had; according to my husband, it was as creamy as an iced cream. Then came the star, the “Hot Chicken” on white bread with ranch dressing and dill pickles. We chose the dark meat option and were pleased with the juiciness of the meat and the crunchiness of the breading. The heat from this dish was tempered by the white bread and ranch dressing. The collard greens with ham hocks and pot liquor were next. The ham was shredded after it was cooked down, and the whole combination was melt in your mouth comfort food. Then came the crispy fried green tomatoes with buttermilk horseradish and the smoked lamb belly with cola sauce, green beans and tomatoes. The lamb was sinful…the rendered lamb fat and cola sauce made for a decadent finale. Finale to the savory dishes, that is. For dessert, we ordered the banana pudding doughnut with spiced sugar. The experience of having the doughnut dissolve on your tongue, leaving the banana pudding behind, is one that I highly recommend. There is no doubt that the warm feel and tasty menu items, not to mention the very reasonable prices, will appeal to students and university employees as well as Philadelphians and visitors looking for a flair of the South in the City of Brotherly Love.